Time Of Violence (1988; 288 min.) 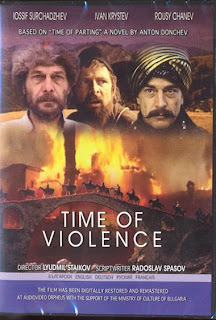 is a MUST WATCH Bulgarian movie and its free of charge (see links below) with English subtitles. The year is 1668 AD. The Ottoman jihad is in its heat in Southeastern Europe. The Turkish siege of the Venetian fortress of Candia (now Heraklion in Crete) has been lasting for a second decade now. The Rhodope Mountain is seen as a strategically important base of the war but its Christian population is a potential source of instability. The sultan orders its conversion into "the right faith". The sacred forests and valleys, where according to the legend Orpheus was born, now screams under the yataghans enforcing the foreign creed in blood and fires. A corps of janissaries is commissioned to the Rhodope Mountains under the command of Kara Ibrahim. At the time, he was, as all the janissaries were, kidnapped from his Bulgarian family, raised as a Muslim, trained to be a ferocious warrior and convert infidels to Islam in a most brutal way. His cruelty stuns even local Ottoman ruler. He stops at nothing but the resistance of some of the locals is invincible. The struggle is half a success, there are many converts, the death toll is heavy, but all the Bulgarian keep their language and traditions on.